Born in Hillbrow, Johannesburg, Taylor graduated with a BA (Fine Arts) from the University of Pretoria in 1996. He lives and works in Pretoria. His sculpture Reckson and Chiwara depicts an employee of Dionysus Sculpture Works who has been a friend for the past eleven years. This is followed by the stacking of a thought bubble of a buffalo, O’ryperd, the study of a horse named Chunky, and the very first donkey he modelled. 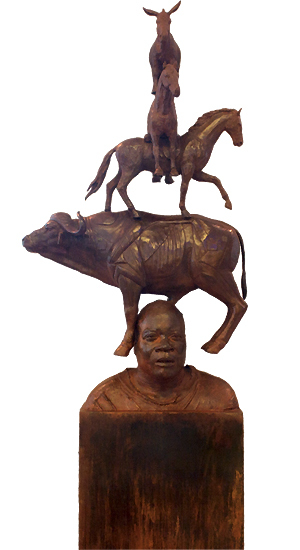 These are all equestrian related sculptures and Chiwara was his point of departure.